Before fading out slowly until death, stars with masses similar to that of the sun, go through a spectacular phase in which they release the matter of their atmosphere with a puff: this is how a planetary nebula is born. At the center of the coloured ring of gas there is a white dwarf, the star’s compact and very hot nucleus is doomed to scatter heat and residual light progressively into space until it becomes a translucent and cold body. This nebula, called Helix, is 650 light years from Earth and because it is so close, when looked at through a telescope it appears to be as large as a half full moon; actually, its diameter is about 3 light years, three quarters of the distance between the Sun and the closest star, Proxima Centaurus. 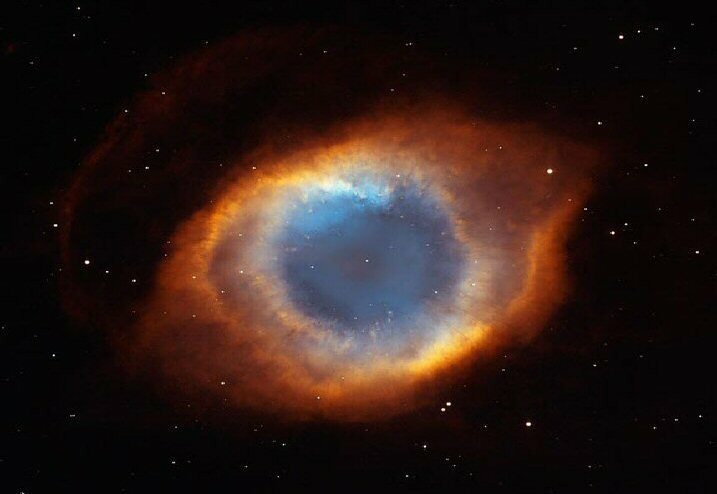 Credits: NASA, NOAO, ESA, the Hubble Helix Nebula Team, M. Meixner (STScI), and T.A. Rector (NRAO).